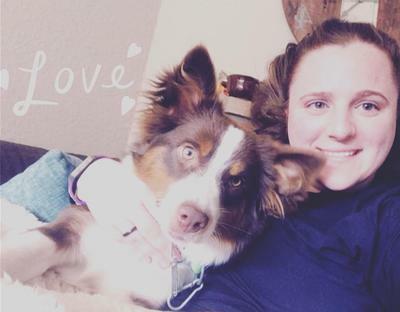 Hello everybody, I have a red tri Aussie named Aspen, and he is just the sweetest most good natured dog I have ever had. He is fixed and just about a year old, and he is SO anxious. Chewing on the molding, digging holes, ripping up clothes that he happens to find around the house, chews up his kennel, etc. When we are at work he and his Jack Russell sister have a whole room to themselves to play in, of a pretty decent size. When we get home we let them out to go play, and after the first few minutes Aspen is back to destroying things again. (He never destroys anything in his play room). We take him for walks, we have tried over the counter things from pet stores...but taking him to a trainer/behaviorist is not financially an option for me right now. Does anyone have any suggestions on how to calm him down? I just want him to be a happy little pup. I feel so bad that he feels this way. Please help! Hi Morgan, I've added a page to the site about a dog training option you might want to check out. It is much less than hiring a dog trainer one-on-one. It has all the benefits without the huge cost. You will want to address the underlying issue that is resulting in all the problems that are arising. It's like when people eat poorly and get a lot of symptoms. They will take a pill for high blood pressure, high cholesterol, and insulin if they develop diabetes instead of just eating healthier. Same thing with dog training. Bad behavior can show up in several ways and dealing with the cause can clear up several behavior problems at once. Here's the link with more info.